A good friend from college gave a speech at our wedding about my husband’s penchant for all things that start with the letter “P.” It was something I hadn’t thought of until then, but all my husband’s favorites do begin with P — Pamela (that’s me! ), Penn (where we went to college,) Pittsburgh and their sports teams like the Pirates and Penguins, pizza (his favorite food), pasta (his second favorite food) and anything with Parmesan cheese. Almost 19 years later, despite living in LA and eating my food every day which I assure you is not a lot of pizza and pasta, the man is still the same. And that’s a-ok with me since I’m still in the picture, too. In the same way I can get our son, aka Mr. Picky, to eat almost anything in a corn tortilla, I can pretty much ensure success with my husband if I put Parmesan cheese on it. He even takes the liberty of adding Parmesan cheese where it may not really belong, but it’s his default if he thinks the dish needs improvement. And if we’re out of Parmesan, no problem! He’ll reach for the Pecorino, naturally. 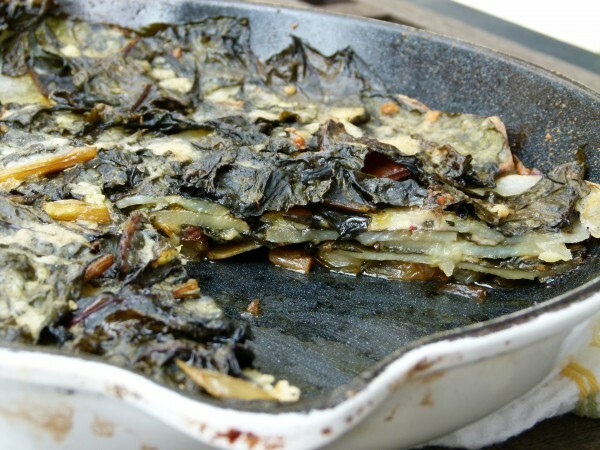 I saw this recipe on the Whole Foods website for a Swiss chard and potato cake that looked divine, but was loaded with gruyere which doesn’t always agree with me in large quantities. So I lightened it up a bit with Parmesan and we all loved it (except for Mr. Picky who would not try it because he is, ironically, Parmesan-averse.) Not so easy my job, is it? Dark green leafy vegetables are so abundant right now and always the perfect, super-nutritious addition to any meal. I think this recipe, which is warm and hearty, is ideal for the transition into spring. (Don’t worry, it will feel like spring soon!) I haven’t tried this with any other leafy green, but I do think chard is perfect for the job. I love bitter greens, and if you do too, I have no doubt kale would be great here. I think spinach is a little too watery, but I could be wrong. This gratin would be perfect for Easter brunch or dinner, especially if you’re serving lamb or poultry. Couldn’t you also imagine this with a side of soft scrambled eggs and a fresh baby greens salad? Love it! Of course you don’t need a special occasion to serve this, just a bit of time to allow this to cook. So perhaps it’s not ideal for weeknights if you arrive home at 6:30 and you’d like to eat by 7:00. Although I love this room temp and it reheats well (if that helps.) Feel free (unless you’re married to my husband) to substitute Daiya vegan cheese for the Parmesan and to use all olive oil if you’d like to make this vegan or dairy-free. Any way you make this, it’s a whole lot of goodness. Preheat oven to 350 degrees. Heat butter and oil in a 10-inch skillet over medium heat. Add garlic, onions, diced chard stems and cook until onions are translucent and stems are softened, about 5 minutes. Spread onion mixture evenly in the bottom of the skillet and remove skillet from heat. Place chard leaves in a bowl and drizzle with olive oil. Toss to coat. 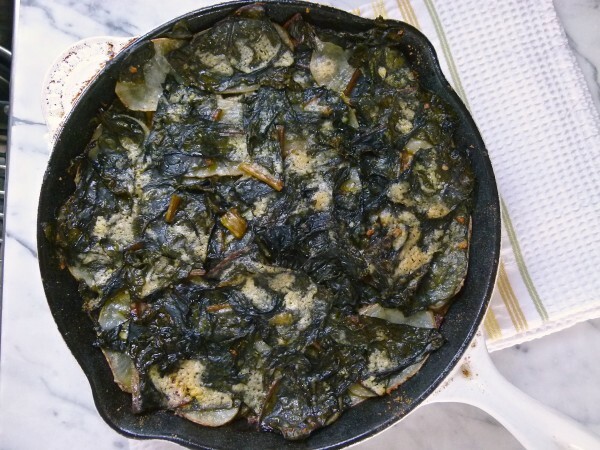 Arrange a third of the potatoes in a single layer on top of the onions in the bottom of the skillet, sprinkle with salt and pepper, top with a third of the Swiss chard and scatter ¼ cup of the cheese over the top. Repeat the process to layer the ingredients two more times, ending with the cheese. Cover skillet tightly with a lightly oiled piece of parchment paper then aluminum foil and bake until potatoes are easily pierced with the tip of a knife, about 1 hour. 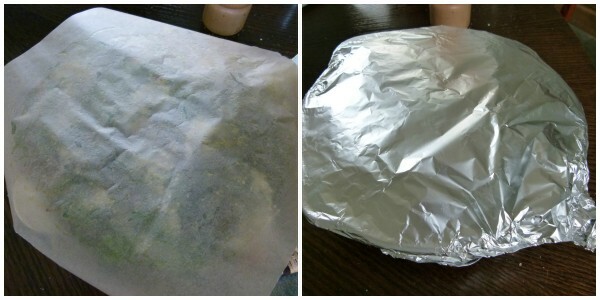 Gently remove the foil then return skillet to the oven and bake until cheese is browned on the top, about 10 minutes. Set aside to rest briefly, then slice into wedges and serve. This recipe is AMAZING!!!!!! I made it today for a brunch I was hosting and the ladies ate every last piece. I had leftover potatoes (I sliced them in the food processor)so I went back to the store to get more swiss chard and made another batch for dinner for my family. Besides being delicious what I like about this recipe is it’s super easy and few ingredients. 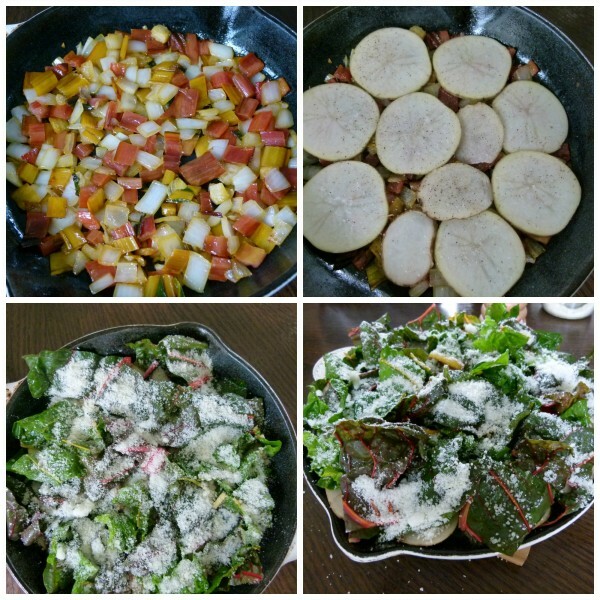 I”m not a very experienced cook and this was very easy to make. That’s great to hear! Thanks for sharing :). This is really delicious. The flavors all seem to meld together beautifully. I’ve made it several times, including for dinner company, and everyone raves about it.